Bar Professional Training Course (BPTC) student clinches top spot among the finalists in a keenly contested competition sponsored by Savills. 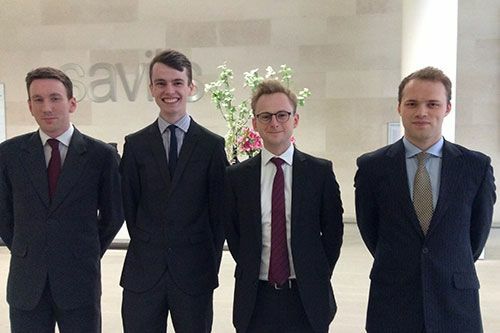 Mark Galtrey (first from left above), studying on The City Law School’s (TCLS) Bar Professional Training Course (BPTC) won First Prize in the Senior Moot 2015, held on 7th May at the London headquarters of Savills, the international property experts. The case for City’s premier postgraduate moot centred around the Bribery Act. Galtrey and his team-mate Samuel Parsons (who won Second Prize) faced the defence team of Edward Blakeney and Guy Oliff-Cooper, who were highly commended for their presentation of arguments. 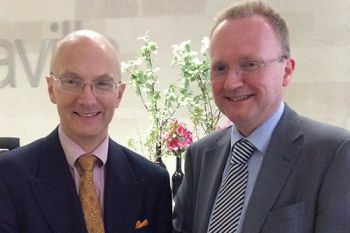 The Judges for the evening were Professor of Criminal Law at the London School of Economics, Professor Jeremy Horder and Assistant Dean at The City Law School, Professor Peter Hungerford-Welch. Clive Beer, a director of Savills, warmly welcomed finalists, judges, moot directors (Joanne Moss and Emily Allbon) and audience members to the event and presented the trophy and prizes at the end of the moot. “Throughout the year, the moots were a great opportunity to practise advocacy, receive honest and constructive feedback from the judges, and to pick up tips from the other excellent competitors. 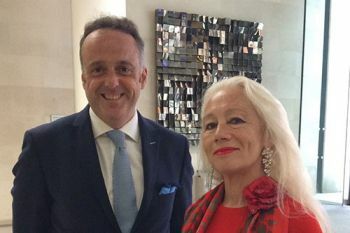 The final had a real sense of occasion thanks to the stunning location, a large and attentive audience, and the prospect of being grilled by experts including the architect of the Bribery Act itself. I was the last to speak, and the standard of the speeches I heard while waiting seemed rather daunting, but once I was on my feet I really started to enjoy the experience, even the judges' politely penetrating questions about my submissions. I'm very grateful to Savills for their generosity and to Joanne Moss for organising everything so smoothly. I'm already looking forward to enjoying next year's final from a comfortable seat in the audience”. Second Prize winner, Samuel Parsons, took home £750 while other finalists won £300 each. Advocacy is the means by which a barrister puts his or her client’s case to the court and may be both written and oral. It is a specialist skill, the quality and excellence of which distinguishes the Bar from other providers of legal services. It is in the interests of the public, the court and the profession that barristers present their cases to the highest possible standards. Oral advocacy is primarily a performance skill. It requires the advocate to address the court persuasively and concisely, presenting their cases in a manner which is clear, well organised and efficient. Key advocacy skills include case analysis, use of skeleton arguments, oral submissions, examinations-in-chief and cross-examination, pleas in mitigation and legal submissions.